BOSTON, MA - Boston Bruins General Manager Peter Chiarelli announced today that the club has signed forward Jeremy Reich to a one-year contract. Per club policy, financial terms of the deal will not be disclosed. The 31-year-old Reich is a veteran of three NHL seasons, two of which he played for Boston from 2006-2008. He has skated in 99 NHL regular season games, registering 2-4=6 totals and 161 penalty minutes. He made his NHL debut in the 2003-04 season with the Columbus Blue Jackets, playing 9 games and registering 1 assist during a call-up. In September of 2005, the Bruins signed him as a free agent. 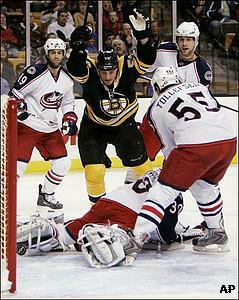 He scored his first NHL point with the Bruins against his former team, Columbus, in December 2007. He skated 199 games with the Providence Bruins over three seasons, totaling 33-35=68 and 479 penalty minutes. On June 2, 2009 Reich was signed as a free agent by the New York Islanders where he then went to play 33 games last year with their AHL team, the Bridgeport Sound Tigers, totaling 12-8=20 with 24 penalty minutes. The 6’1” 203-pound native of Craik, Saskatchewan was selected by the Chicago Blackhawks in the second round (39th overall) of the 1997 NHL Entry Draft. In the two years Reich spent in Boston (2006-2008) he played in 90 games and totaled 2-3=5 with 141 PIM.